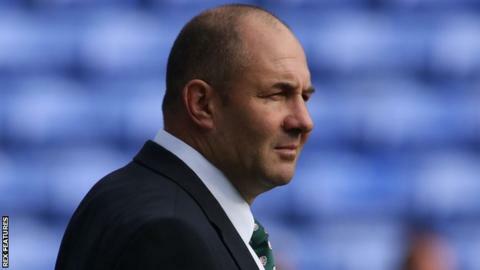 London Irish head coach Tom Coventry admits his side still have work to do to "gain respect" in the Premiership. Irish beat fellow strugglers Newcastle 20-15 on Sunday at the Madejski Stadium to move off the bottom of the table. But, Coventry almost saw his side surrender a 20-point lead in the second half and stressed areas his squad needed to improve in weeks ahead. "It's about where we're at in the competition and needing to win every week," he told BBC Radio Berkshire. Victory against Newcastle was only The Exiles' second in their opening nine Premiership games, but did see them switch places with the Falcons. "People spoke about a relegation battle in the lead up to this game," Coventry added. "We didn't address that at all during the week. "I don't think dwelling on that sort of element really helps too much. It's more about what we're trying to achieve and we haven't even had a full round of games yet. "It's nice to get the points today, but for me there's no pressure off us. "We want to continue to grow as a club and we certainly need to be consistent with our aim of gaining respect in the competition, which you have to work pretty hard to earn."